Go to Lizzie’s Lunchbox to get schooled on a fine mix of Texan and Mediterranean dining with fantastical dishes like the Cherry Cola Lamb Kebab and a Bourbon Mango Pulled Pork Sandwich.Note: Requires slow cooker. 1. Place the bay leaves in the bottom of a slow cooker and place the pork on top. 2. Sprinkle pork evenly with salt, garlic powder, cumin, oregano, coriander, and cinnamon. Pour the water around the sides of the pork, being careful not to rinse off the spice mixture. 3. Cover and cook on low until the pork shreds easily with a fork, about 8 - 10 hours. Turn the meat after it has cooked for 4 - 5 hours. When the pork is tender, remove from slow cooker, and shred with two forks. Use cooking liquid as needed to moisten the meat. 1. Toss all ingredients gently and let marinate in the fridge for at least 1 hour. 1. Peel and roughly chop the mangoes. 2. Place a large saucepan over medium-high heat and add the chopped mango. Using a potato masher, smash the mango into a thick, chunky paste and cook until the mango has reduced and darkened slightly, about 5 minutes. 3. Add the honey, chipotle powder, and whiskey and stir to blend. Bring to a simmer. Reduce heat to medium-low, and simmer, stirring frequently for 2 – 3 minutes, allowing the alcohol in the bourbon to cook off. 4. Stir in the barbeque sauce and remove from the heat. 5. Gently stir the shredded pork into the mango barbeque sauce, taking care not to break up the tender pork too much. It’s desirable for each sandwich to have some chunks of meat that are identifiable as port. Heat until warmed through. At Lizzie’s we served the pork on toasted soft hamburger buns, but chewy bakery-style rolls are good, too. 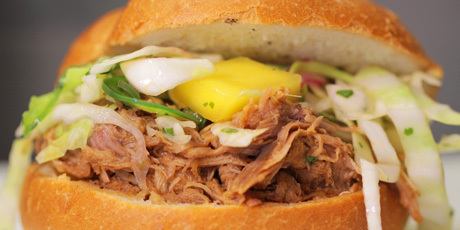 Top the pork with Mango-Jalapeno Slaw and dig in!